An inspiring Professor in Management popularly known as MKS is a Teacher, Researcher, Institution Builder and a Mentor to thousands of students. He has teaching and research experience of over forty years. He has served as Professor, Dean & Director of Department of Management Studies at Bangalore University. He was Member Secretary and Executive Director of Karnataka Knowledge Commission from 2009 to 2013. Currently he is the Member National Education Policy drafting Committee and a Member of Central Advisory Board of Education (CABE), Ministry of HRD, Government of India and Member of All India Board of Management Studies, AICTE. He was conferred with “Karnataka Rajyothsava Award” by Government of Karnataka and “General President Gold Medal” by Indian Science Congress Association. He has served in the Indian Air Force from 1964 to 1986. He was a qualified Instructor at Air Force Instructors’ Methods School, Chennai in 1972. He has worked with Kirloskar as Group Adviser. He is a Member of Governing Council, Kirloskar Institute of Advanced Management Studies, Karnataka. He is also a Managing Trustee for Mysore Kirloskar Education Trust which is currently running Eight Schools in rural areas. He leads assessment teams as Senior Assessor for assessment of major industries for their status on Business Excellence through EFQM Excellence model. He has also served as President of Centre for Leadership and Management in Public Services. He has been awarded “Vira Chakra” for Bangladesh Operations-1971. A post-graduate in Agriculture by qualification, a Rural Development Scientist by practice, she is committed to bringing ‘visible transformation’ among rural and semi-urban youths through skill-based, practical, real-time corporate experience-based learning process in business management. She is committed to work on any project that would have a visible impact on making higher education ‘responsible and accountable’ to the students. 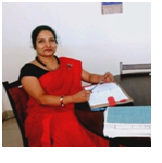 She served as Member of Academic Council of Bangalore University during 2010-13. Currently she is Executive Director & Chief Corporate Relations, BSBS - The B-School, Bengaluru. She is serving as Member of Board of Governors (MHRD, GoI Nominee) and Member of Senate, NIT - Goa. An alumni of Jawaharlal Nehru University, New Delhi and receiver of prestigious Erasmus Mundus Scholarship (2008) to pursue Master's in Lifelong Learning: Policy and Management, joint degree from University of London (UK), University of Aarhus (Denmark) and University of Deusto (Spain) from Directorate of Education and Culture, European Union. He was DAAD visiting-faculty Julius-Maximilians-University of Wurzburg, Germany. He was visiting-faculty at the Tamil Nadu National Law School, Tiruchirappalli. He has been faculty at the National Law School of India University, Bengaluru. He was awarded with “Social Justice Medal” by Hon’ble Chief Justice of India, Ministry of Law and Justice, GoI in 2007. Currently, he is Deputy Director, Ramaiah Public Policy Center and Assistant Professor, Ramaiah College of Law, Bengaluru. A HR professional with over two decades of Industry experience across various facets of HR function specializing in Talent Acquisition, Workforce Management, Employee Engagement, Client Advocacy and Customer Experience. She worked across IT Product R&D, Services, ITES and Tech support across industry verticals, technology domains, and Global Hiring. She served at DXC Technology, Wipro Technologies, etc. Currently she is Global Head of Human Resources at Opus Consulting Solutions, Pune. A motivating Professor in Management and able Administrator, he is committed to work on initiatives that would have a positive impact on quality in education. He served as Academic Council Member of Bangalore University and Chief Coordinator of Knowledge Fellowship Project of Karnataka Knowledge Commission. Presently he is working as Academic Administrator & Strategic Planner at Gopalan Foundation, Bengaluru. He is also MHRD Nominated Member of Board of Governors, Indian Institute of Management and Member IIM Society, Tiruchirapally. Tamil Nadu. He is passionate to work on areas of education reforms, student & youth development. As a social worker he is serving the education community from last 20 years and committed to work towards bringing reforms in education system. He supports and involves in the initiatives that would contribute in overall development of the students. He is the first Ayurvedic post graduate to qualify for the Ph.D. competitive entrance examination and complete the course at Department of Neurophysiology, NIMHANS, Bengaluru. His contributions are extensive to the field of Ayurveda Research. He has published 38 research papers in National and International Journals. He was part of Govt. of India delegation to Germany in 2016, to opine on the prospects of international cooperation between India and Germany in respect of Ayurveda education and treatment. Central Council for Research in Ayurvedic Sciences (CCRAS), Ministry of AYUSH, GoI conferred the honour of “Young Scientist” Award in Clinical Research” in 2017. Currently he is serving as Research Officer (Scientist-2, Ayurveda) at Regional Ayurveda Research Institute for Metabolic Disorders (CCRAS) Bengaluru. He pursued M.Tech from IIT Kanpur, Ph.D. from Indian Institute of Science (IISc) Bangalore and served as International Research Staff at UPC BarcelonaTech Spain with European Union Fellowship. He has authored three books, published several research articles and is a reviewer for many international journals. He was featured by The New Indian Express in Edex anniversary edition in 2017 and honored with Edex award: 40 under 40 - South India's Most Inspiring Young Teachers. He is currently the Secretary of Indian chapter of International Association for Coastal Reservoir Research (IACRR), and on the board of directors at IIT-Kanpur based start-up G-Intelligence. 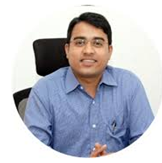 He is presently Associate Professor in the School of Civil Engineering, Vellore Institute of Technology, Vellore.